﻿﻿Reading music is like having another language in one’s mind. I knew nothing of this until as a 16 year old boy I was accosted on my way to supper at the cafeteria in my school at St. Ed’s in Austin, Texas. I was waylaid by Brother Edwin Reggio, CSC who told me, “Alex I need a alto saxophonist in the school band. You are it.” I tried to explain that I wasn’t interested or that I did not know how to read music but to no avail. The very next day I had my first music lesson and I soon was an efficient alto sax player who could read music in a slightly better than primitive level. I do not play the alto saxophone nor do I remember half of what Brother Edwin taught me about reading music but there is no doubt in my mind that I am a better person than I would have been by simply having those music classes. You can imagine how upset Rosemary and I were when Rebecca told us some years ago that she was going to abandon her piano classes. Part of the problem was a lack of incentive at home from her parents. I asked Rebecca to sit down and I told her that the very least she could do was to show up at her class and tell her teacher (a youngish Russian) that she was going to quit. I told her that wasn’t going to be the one to tell him. She acceded to my request. That was indeed the plan and the Russian was astounded but went along with the plan when I told him that I would pay him as if Rebecca were taking lessons every week. Rebecca’s father was not too happy supposing I had arm-twisted her daughter. In the end Rebecca did quit but it is my hope that enough music reading knowledge is in her head that I will help her in the future. The above has all to do with meteoroids and meteorites. We all know that when a bolide or a very bright light in the sky hits the ground the fragments are called meteorites. A meteoroid is a suggested term for a sand- to boulder-sized particle of debris in the Solar System. The visible path of a meteoroid that enters Earth's (or another body's) atmosphere is called a meteor, or colloquially a shooting star or falling star. If a meteoroid reaches the ground and survives impact, then it is called a meteorite. Many meteors appearing seconds or minutes apart are called a meteor shower. The root word meteor comes from the Greek meteōros, meaning "high in the air". Neither Minor Planet Center nor JPL uses the term "meteoroid". A meteor is what you see when a space rock falls to Earth. It is often known as a shooting star or falling star and can be a bright light in the night sky, though most are faint. 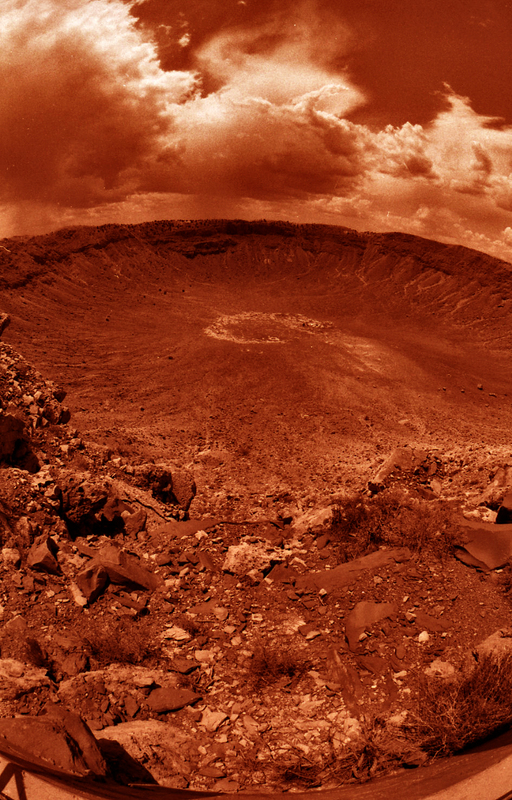 If it hits the ground, it is then called a meteorite and it will leave a hole in the ground called a crater. Meteoroids may range in size from large pieces of rock to tiny dust particles floating in space that did not form planets. Once the meteoroids enter Earth's atmosphere and begin to heat up and break apart, they are known as meteors. Meteors are distinct from comets or asteroids, but some, especially those associated with showers, are dust particles that were ejected from comets. There are several types of meteorites including: stony, carbonaceous chondrites, and iron-nickel. Stony meteorites are named because they are largely made up of stone-like mineral material, carbonaceous chondrites have a high carbon content and iron-nickel meteorites are mostly iron often with significant nickel as well. The above definition does not mention a meteor as being in any way anything that could be solid. As a matter of fact even a rainbow is a form of meteor according to the definition above. This all leaves me in doubt as to what you call a small body of material coming from outer space that enters our atmosphere. The folks at Meteor Crater in Northern Arizona bypass the problems and call a spade a spade by saying that a piece of an asteroid plummeted to earth and struck and left the huge almost a mile wide crater. I cannot understand the name though but I will let the matter rest as this whole blog is an excuse to be able to run my unintended double exposure of Meteor Crater. When we arrived, around noon, Rebecca did not want to get out of the car. She did as soon as switched the engine off. The resulting loss of air conditioning, immediately made her (and us) feel the 40 degree heat. So we entered after paying a hefty entrance fee. Since the original discoverer of the cosmic induced hole had been a mining engineer he put a claim on the place as he planned to mine the hole for valuable metals. The metals never did appear but the family kept the rights to the place so that the US Government cannot establish a Federal or Stage Park. It is the same situation as the Navajo owned and run Monument Valley. Lucky for us both the Navajos and the family of engineer Daniel Moreau Barringer run both places with efficiency and have invested lots of money in making their geological Mecca modern and attractive. While Rebecca balked, Lauren seemed to enjoy the crater and she followed me around in the taking of the pictures. I took a panoramic picture of the crater from a popular vantage point. And then I decided I was going to also use the panoramic camera to get the tourists taking pictures. I soon realized I had forgotten to move the double exposure button from one side to the other (or is that backwards in the other direction?). The resulting photograph is another attractive double exposure that works nicely in probably combining two boring pictures into one and making the result more interesting.